I think the first time I ever heard the phrase “Taco Tuesday” I was in high school or shortly thereafter, and it was a Taco Bell commercial. Do you remember, back when crunchy tacos were $.49? Oh wait…that was Taco Sunday. Well now I don’t remember when or where I first heard of Taco Tuesday! And with that price disclosure, I’ve just made myself sound old. That was like, $.30 ago or something?? I can’t say for sure, I haven’t had Taco Sunday at Taco Bell in many years. But I think I saw (or heard) a commercial recently boasting $.79 tacos on Sunday. Meh. Those were the bomb diggity back in the day, but my taco palate has grown a bit since then. I prefer a soft tortilla, for one. But I also like to be a little more adventurous that just ground beef, lettuce, cheese, and tomato. Not that a good beef soft taco isn’t great now and again, but after trying so many different varieties, it’s hard to go back to the traditional. Ya feel me? The first time I tried them, it did not turn out well. Peanut butter warmed in the microwave = disaster. Thick, pasty, not good. Disaster. But after I made the Thai Chicken Tacos and realized it was possible to make a smooth, creamy peanut butter sauce without involving the microwave, I decided to make these again with a different version of peanut butter and Sriracha sauce. This one was a winner! I put in the instructions below, to add the liquids in small amounts until you get to the flavor profile and consistency you like. You all know how I love tangy, vinegar-y flavors. You may not, so you may not want to add as much vinegar. You may want more soy sauce, or more lime juice. More SRIRACHA! Some people use sugar in their peanut butter sauce…I did not. You can throw some in if you like…1/2 teaspoon or so. I wanted my thin enough that I could get a spoonful and just drizzle it over my tacos and it would still stay put. Mmm. Just thinking about that sauce is making my mouth water a little. At 6 am. That’s not good. I’ll have some more coffee instead. Can we just stay on Tuesday for awhile? I think this is the first week in the history of…ever…that I haven’t been looking forward to Friday. Why, you ask? Because one of my very good friends that is also a close co-worker is leaving on Friday. She and her family are moving back to their hometown where all of their family is. I get it. It makes perfect sense, especially with their new baby. But dammit if I’m not gonna miss them!! I know we’ll keep in touch and I’ll see them from time-to-time, I’ll just miss my everyday work buddy. You don’t realize, sometimes, just how much of your day/life is spent at your job. You generally see co-workers more than your own family, if you work outside of the home. I guess now, at almost 34-years-old, I’m starting to really understand that “old timey” emphasis on family dinner time. For many it really is the only time they can all sit down together as a family during the day. I think having a themed food night is a good way to bring the family together…whether it’s Taco Tuesday, Game Night Friday, or something else, where the family gets together and actually spends time together. Not with faces buried in computers or cell phones, but actually talking and doing something fun together. It’s a foreign concept to many, I know, which is sad really. So, whether your family consists of you and a significant other, you and a roommate, or if there are kids in the mix as well…take the time to talk about your day together, eat a meal (these tacos, perhaps?) and unwind together each night without TV or cell phones or computers. It’ll do wonders for your relationships and your own happiness, I assure you. We all need those connections and those bonds that seem to be lost with the ever-increasing obsession with technology. I fall victim to it as well, so I understand the need for all this as much as the next guy. Place the steak in a shallow dish. Season with salt and pepper, and enough Worcestershire sauce to cover the top of the steak. Cover and refrigerate for at least half an hour. Heat a large skillet over high heat. Spray with cooking spray or coat with 1 teaspoon of olive oil. Place the steak in the hot skillet and sear for 2-3 minutes. Flip and cook for another 2 minutes or until steak is barely pink in the middle. Remove steak to a cutting board and allow to sit for 5-10 minutes before cutting into strips, against the grain. Meanwhile, prepare the Sriracha peanut butter sauce by combining the peanut butter, and 1 tablespoon at a time of the soy sauce, rice vinegar, and lime juice to get to your desired consistency and taste. The more vinegar you add, the more tangy it will be. I happen to like a thin, tangy sauce, so I added more than a tablespoon of each, but I know not everyone likes vinegar as much as I do…so add a little at a time. And make sure to stir, stir stir until it’s well-combined before adding more as the consistency can change a good bit – from thick to thin in a few extra stirs. You will be able to tell when it’s fully combined. Then stir in the Sriracha, again a little a time until it’s the perfect amount of spicy, tangy, peanut buttery deliciousness for you! Warm the tortillas and top with a few strips of steak. 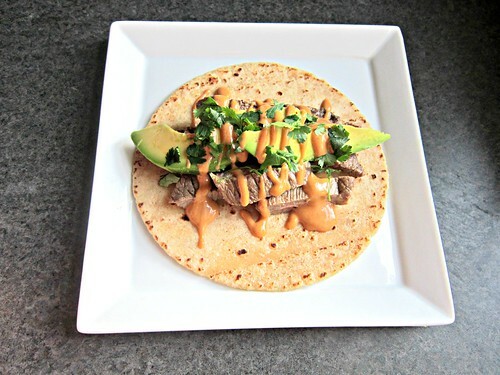 Top with a drizzle of Sriracha peanut butter sauce, a couple of avocado slices, and a sprinkle of cilantro. I love theme nights – gives everyone something to look forward to.